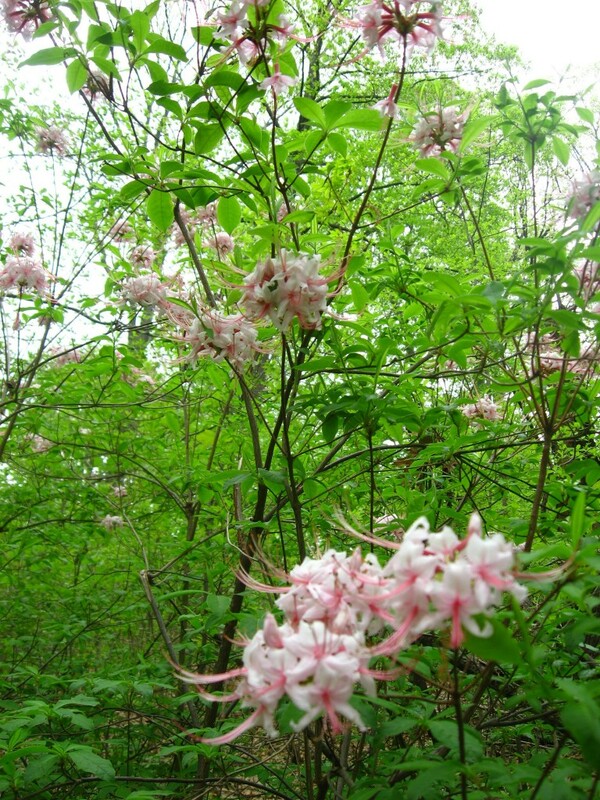 A NATIVE SHRUB IS BLOOMING. 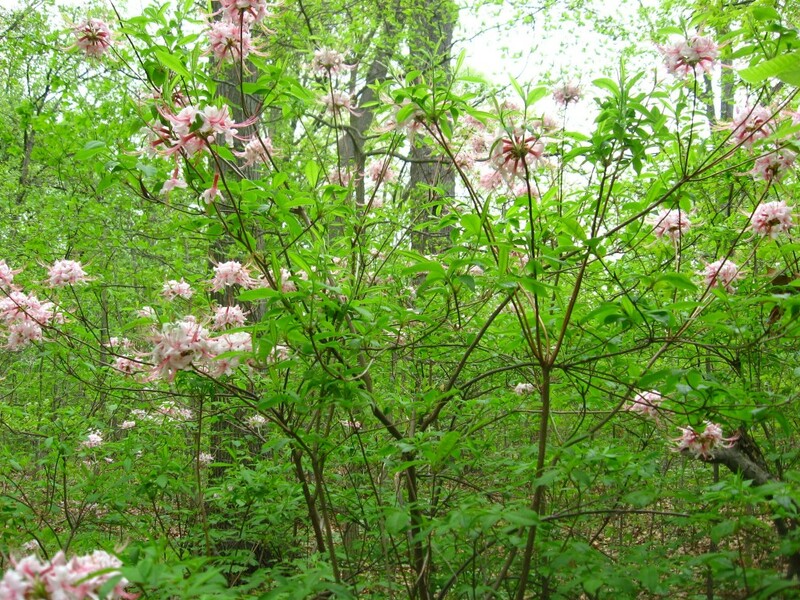 This native shrub grows in the vicinity of the Overlook, the area where the Morris Park Road trail meets the upper trail, which connects Lotus road to Woodcrest Avenue. The Overlook is a place of special importance, and it is no surprise that there is a fine display of Rhododendron periclymenoides along the viewing area. 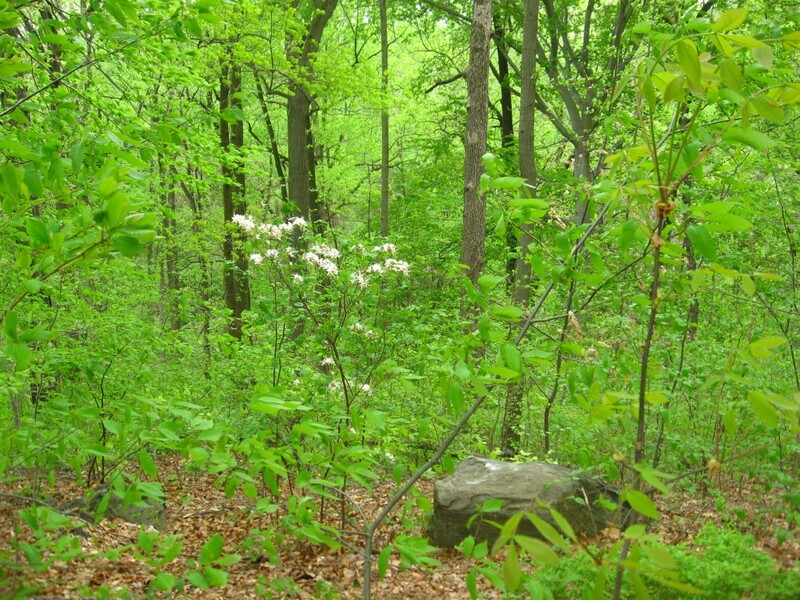 The high diversity of plant species growing in this special area is inspiring, considering the area also offers a view of center city Philadelphia in the wintertime. This is a moist upland area, and for most of the year, all that can be seen and heard are trees rustling in the wind and a waterfall of the Indian Creek 80 feet below. Breezes can be afforded in this spot even on hot summer days, that are stifling only a five minutes walk away into the adjacent urban neighborhoods. 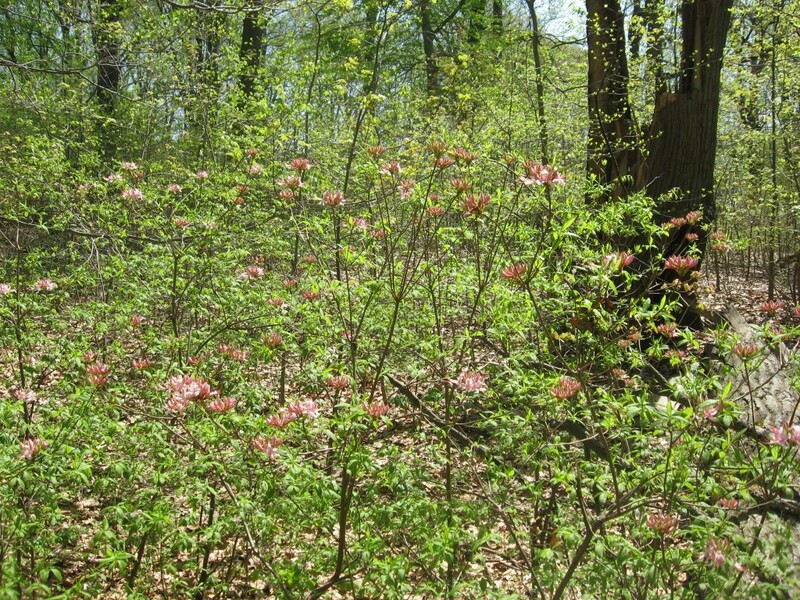 Nestled below a canopy of mature Beeches and Oaks, the shrub layer of Rhododendron periclymenoides can be seen going down the steep hillside, with blooming bushes visible down the hillside where it grows amidst Spicebush and Lowbush Blueberry, and American Chestnut, also a once grand tree that dominated the forest canopy now reduced to the height of a woodland shrub. The large population of American Chestnut that grows in the area also has sparked the imaginations of many. 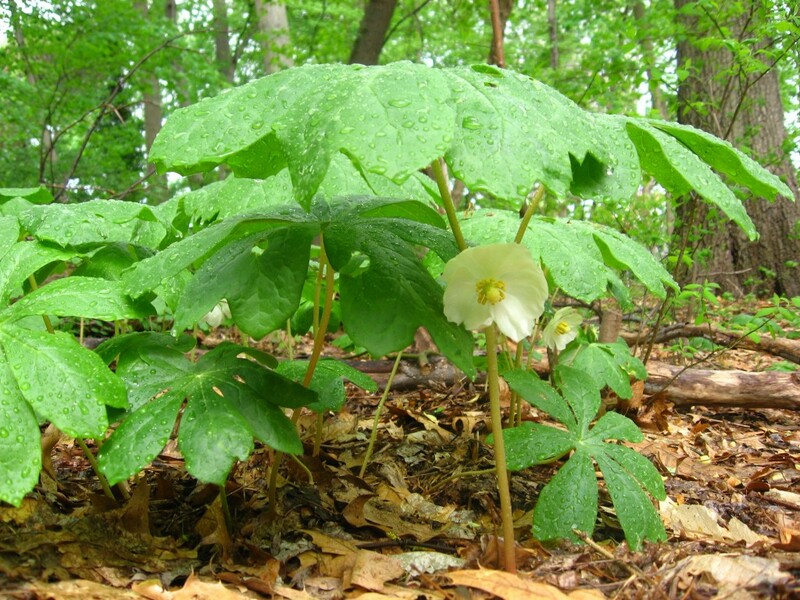 These small shrublike trees with exotic toothed leaves that grow to almost a foot in length grow abundantly in the moist upland areas along the Morris Park Road Path. Each specimen is most likely 10os of years old, the young shoots growing out of an ancient root system. 30 years ago, the vestiges of the original trunks could be excavated from the leaf litter, a circle of rotting wood around the spindly stem of the original tree, but even these remnants have since rotted away. The roots are still alive, and are not affected from the chestnut blight, an introduced pathogen (Cryphonectria parasitica) carried into America from Asia, on an imported Chinese chestnut tree. The tree above is susceptible, and dies off every few years. the roots send up new shoots and the tree lives on in the form of a shrub. The Chinese Chestnut tree is an exotic tree that has carried the Chestnut fungus, that has caused the blight that has all but destroyed the American Chestnut tree, and it is resistant to this fungus, and can grow just fine here in America. Here is an example of an imported, alien plant that is not invasive (at least yet). However, the damage it has cost to our forests is catostrophic and barely quantifiable, although attempts have been made at quantification. When we talk about non-native introduced species to our neighbors, we often start with this one. 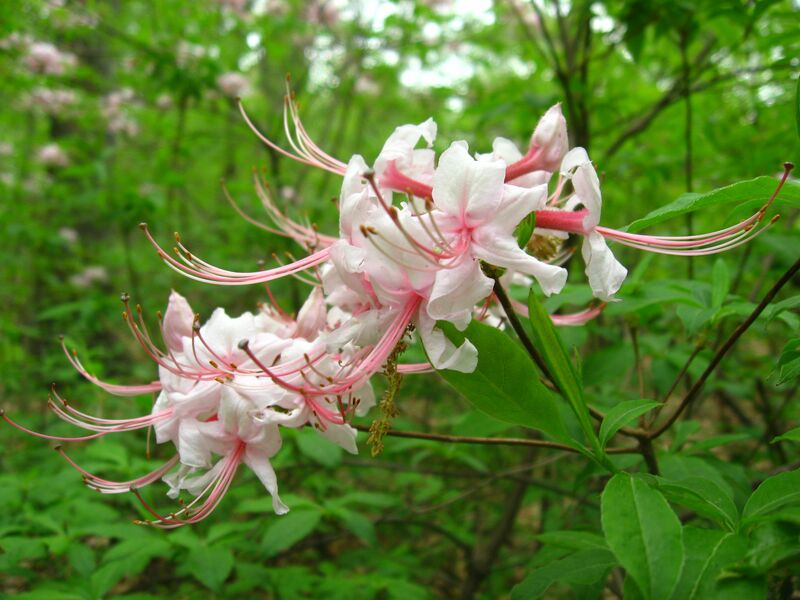 We are happy that the introduced azaleas into America have not brought a fungus that has blighted the beautiful native Azaleas so far. 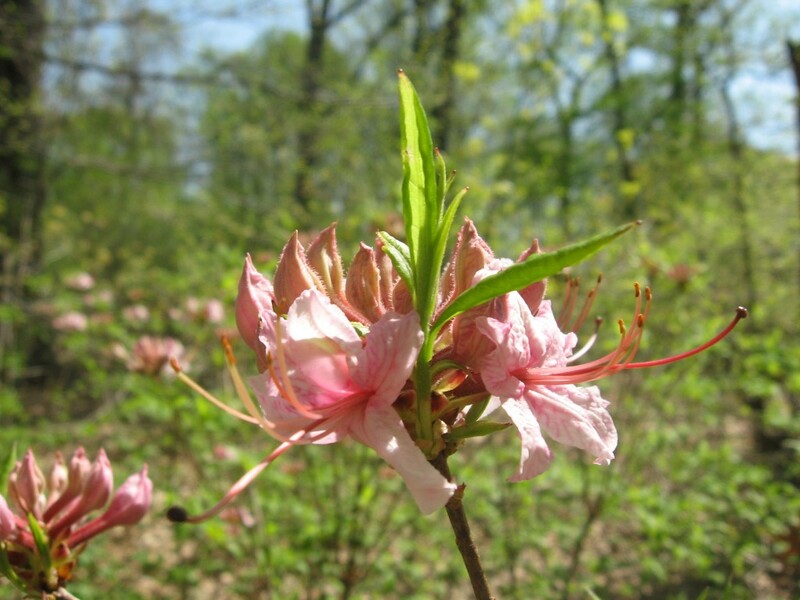 This Pinxterbloom azalea is a source of nectar for the Monarch butterfly, for one. Here is the view we have been talking about all this time. This picture, taken this morning, is from the Lookout. At the very front, to the right, is the spindly specimen of the American Chestnut, Castenea dentata. To the immediate left is a rock, part of the Wissahickon Schist formation, a metamorphic rock, much in need of discussion. To the left of the rock is a Rhododendron periclymenoides, the Pinxterbloom azalea, just growing on the rich upland hillside. On a balmy spring day, the Overlook is a happy place, with blooming Mayapples, and every tree and shrub leafing out. 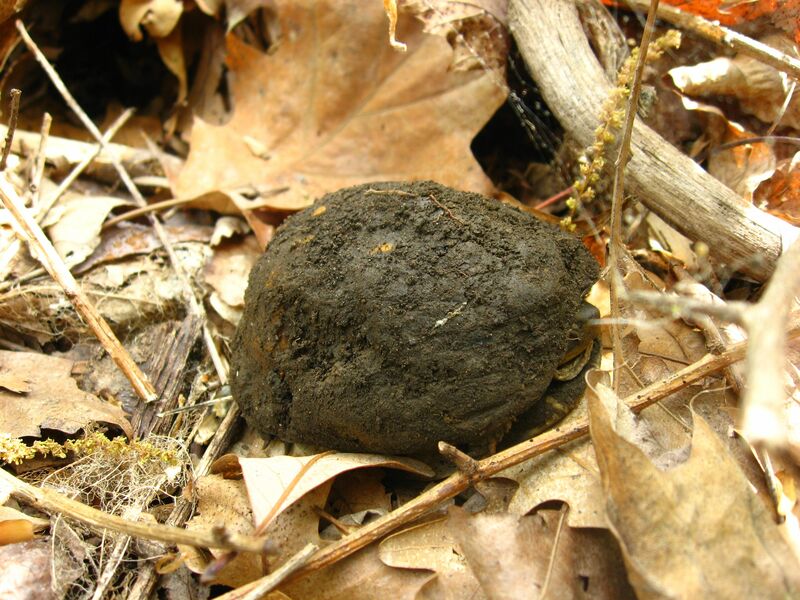 On the way back from the visit with the Blooming Pinxterbloom azaleas in full bloom, this little muddy Box turtle was found. It had been somewhat hot in the past few days, and was due to rain in the afternoon. Perhaps after keeping cool under the leaf litter, this one was ready for a shower. This one looks like it was under there for quite some time. Was it hibernating? Anyone want to chime in about this? Look closely, underneath the double parasols can be found the waxy white flowers in full bloom. The Mayapple flowers have finally come to Morris Park. These pictures were taken this afternoon after some April Showers. 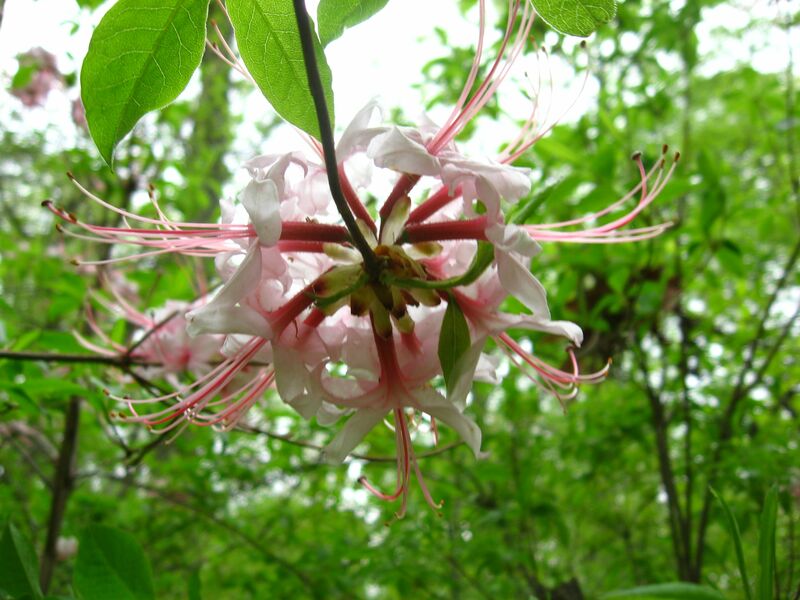 Once lowered down below the leaves, one can see the flowers, many as much as 2 inches across. This is a time when many plants are blooming at once, so it is hard to keep up, or to remain focused on one flower like we have been doing with the Bloodroot. 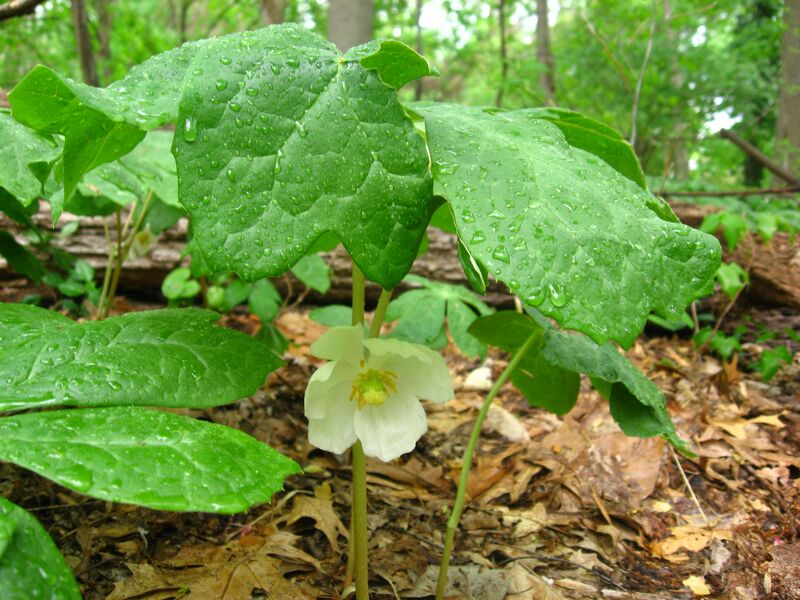 The Mayapple flower can easily be overlooked because they bloom underneath the umbrella-like leaves. 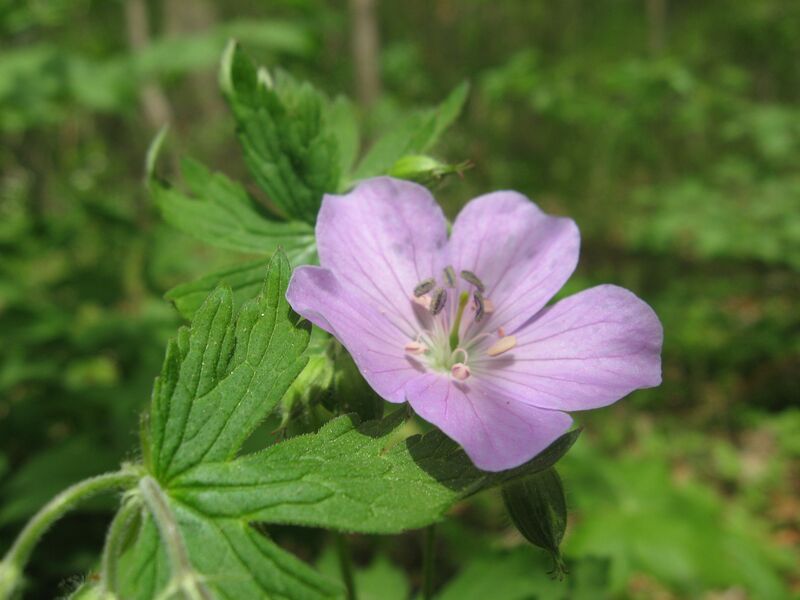 Also this afternoon, this one Geranium maculatum was found blooming. There will be more to come. The native honeysuckle, Lonicera sempervirens, is blooming. 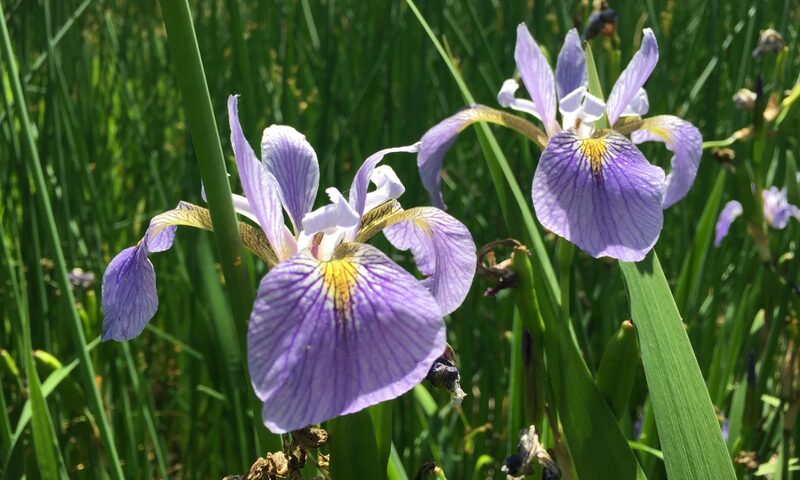 A huge effort has been undertaken to preserve this plant in Morris Park. 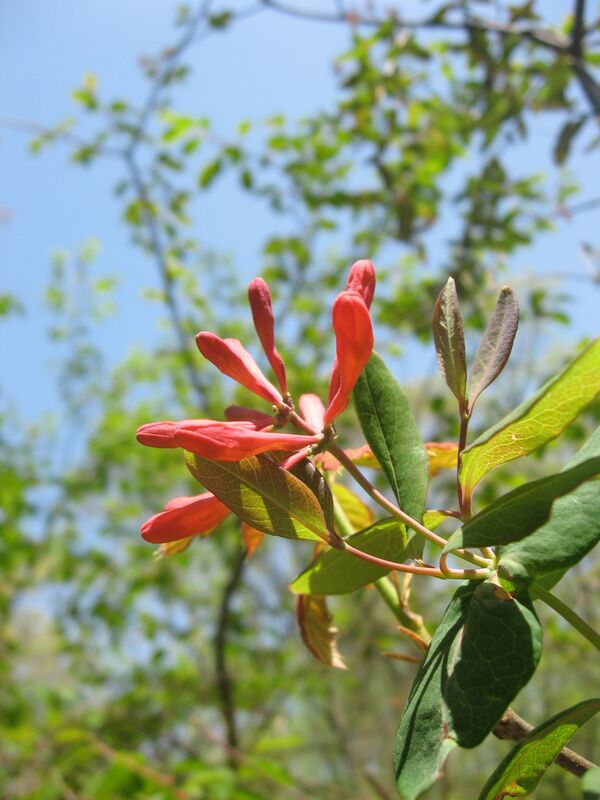 Some of the specimens were mistaken for the Lonicera japonica, the much more common and invasive exotic Japanese honeysuckle and were cut by a well-meaning person who was unaware of the native specimens and wanted to protect the young trees from the choking vines. The two vines are very similar in appearance to the untrained eye. The Sanguine Root took immediate action after this unfortunate incident, and proceeded to carefully remove the Japanese honeysuckle from the entire area, much of which was twining up the same tree as the native one! This was a tedious process, but necessary to preserve the native Honeysuckle. The above picture is our reward for all of the hard work. While we generally avoid any kind of ribbons or tags in the park, there are some circumstances that require their use. 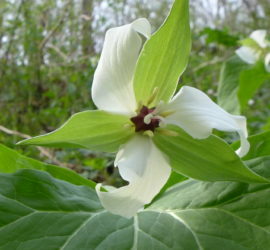 We have small pale -yellow ribbons identifying the plant, so that there will be no more mistaken identity in the future. 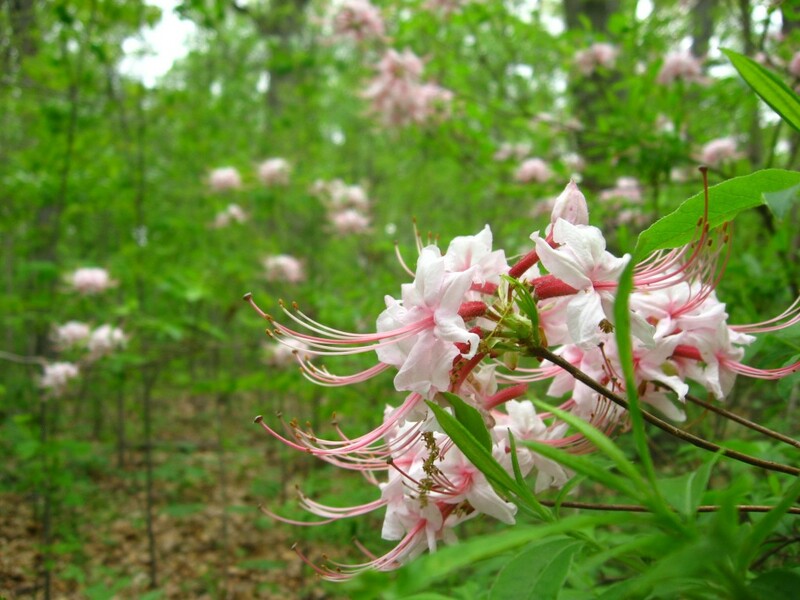 Blooming Pinxter-bloom Azalea. 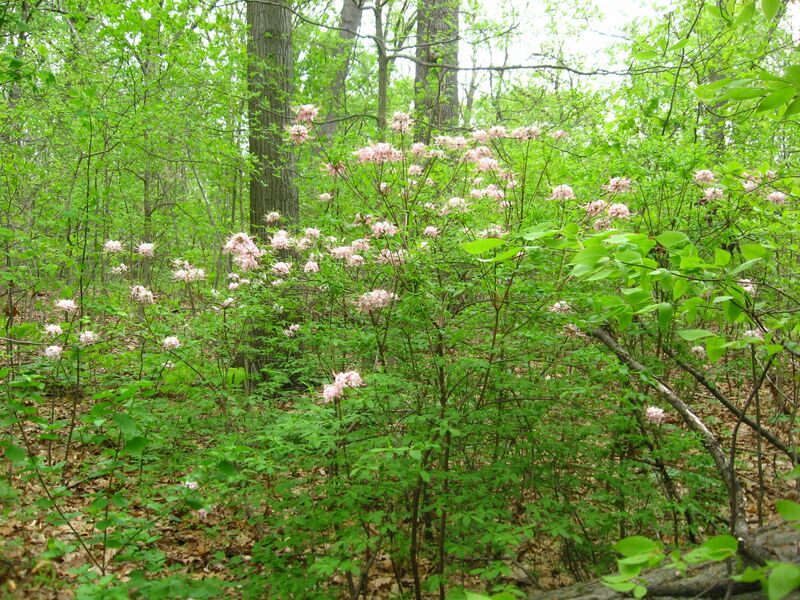 This is a great native shrub in the forest. This specific specimen is the biggest we have ever seen. Hundreds of bright pink blooms! There are a handful of these in the overlook area at the end of the Morris Park Road Trail. We dote over them and make sure there are no invasives nearby. Yeah, we also decided to go ahead and buy one for our yard, and they are available at native plant nurseries.